"Aloor Dom" is originally from Kashmiri Cuisine. 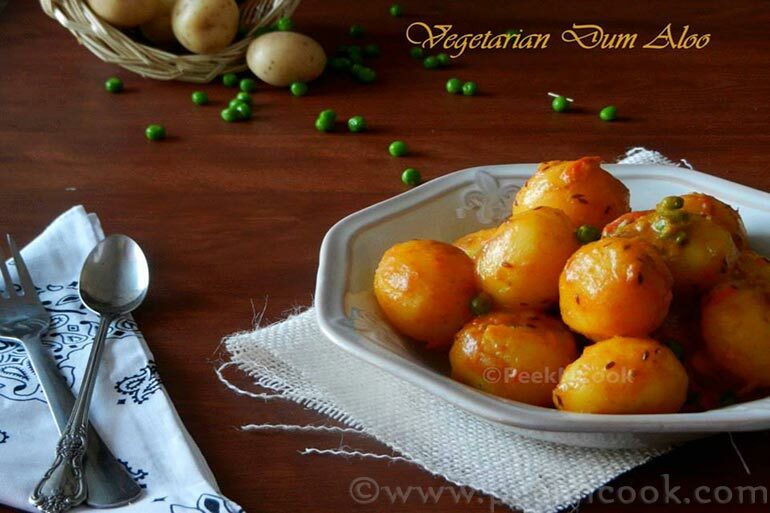 This dish is cooked with small new potatoes along with green peas and other spices. In Non-Bengali cuisines, they usually use onion and garlic, but In Bengali cuisine, we do not use onion and garlic. But without onion and garlic, this dum aloo tastes, even more, better with other ingredients. "Aloor Dom" is originally from Kashmiri Cuisine. This dish is cooked with small new potatoes along with green peas and other spices. Peel the small potatoes, prick them with a fork and soak into the hot salted water for 1-2 hours. Drain the potatoes after 1-2 hours and marinate with little salt and turmeric and keep aside for 15 minutes. Now heat 2 tablespoons of oil in a pan and fry the potatoes till lightly brown and place in a bowl. Heat rest of the oil in the same pan and temper the oil with cumin seeds, cloves, cinnamon, cardamom pods & bay leaf and fry till they start to splatter. Add the chopped tomatoes and some salt to the pan and cover it and cook the tomatoes on low heat till they become soft and pulpy. Mean while take a small bowl and add ginger paste, turmeric, cumin powder, red chili and Kashmiri red chili with 2 tablespoons of water. When the tomatoes become pulpy add the ginger paste & masala mixture to the pan and cook till oil oozes out of the mixture. Now add the fried potatoes and mix with the masala very well, to coat the potatoes with the masala. Now fry for another couple of minutes and add the green peas and coconut milk to the pan. Cover the pan and let the potatoes cook on low heat till they become tender. It may take 15-20 minutes. After 15-20 minutes turn off the heat and garnish with some chopped Cilantro and serve. Serve hot with Puri, Chapati, Roti Or Naan.